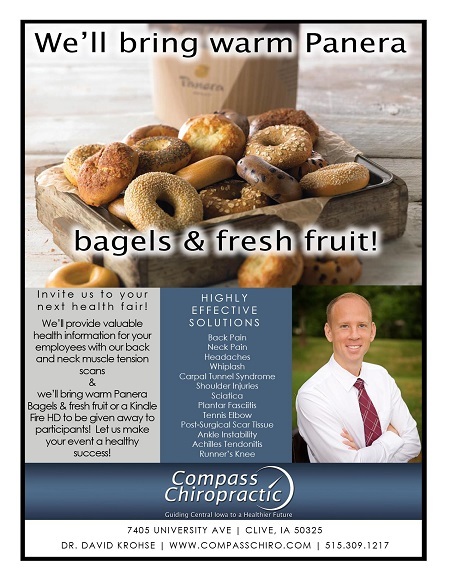 Score Panera bagels and fresh fruit for your company's health fair! Does your company host periodic health fairs? Contact Amy at 309-1217 or compassca@gmail.com and she'll send you a packet of information on the wellness services we provide for larger companies. We participate in the health fairs of a number of larger companies such as American Equity, John Deere, and Casey's and would love to help make your company's health fair a success. Generally at health fairs we perform digital muscle tension scans which employees find very informational. We offer to bring Panera bagels & fresh fruit for all participants. If no additional food is needed, we can contribute a Kindle Fire HD or Galaxy Tab to give away to health fair participants. Get in touch with us today to learn more! No health fairs? Schedule a Lunch & Learn or Screening Session for your team! If your company doesn't host health fairs, don't forget our offer to come and do a lunch and learn. 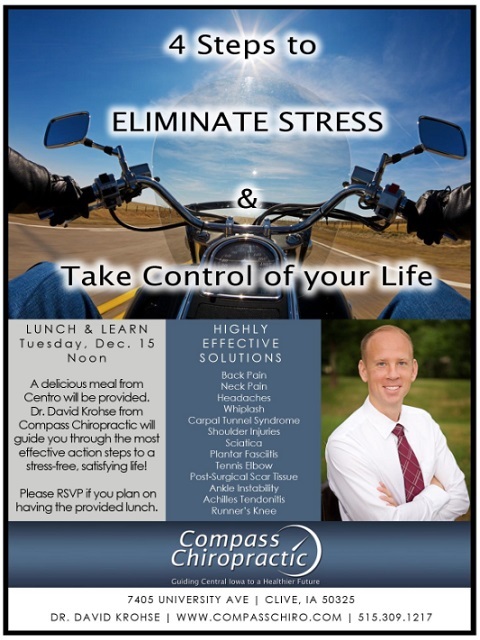 We bring in a great lunch from a restaurant like Centro, Gusto Pizza, or Biaggi's and Dr. Krohse does a quick talk on staying pain-free at work. The talk ends with instruction on valuable stretches to keep your team's necks and upper backs flexible and feeling nice through the daily grind. Dr. Krohse also offers an inspiring talk on the action steps to take control of your life and experience decreased stress called "Four Steps to Eliminate Stress & Take Control of Your Life." A screening session is where we bring a great treat such as the Panera bagels and are available in a break or lunch room for anyone interested to visit with us, have their muscle tension checked, and discuss any health issues that they have. 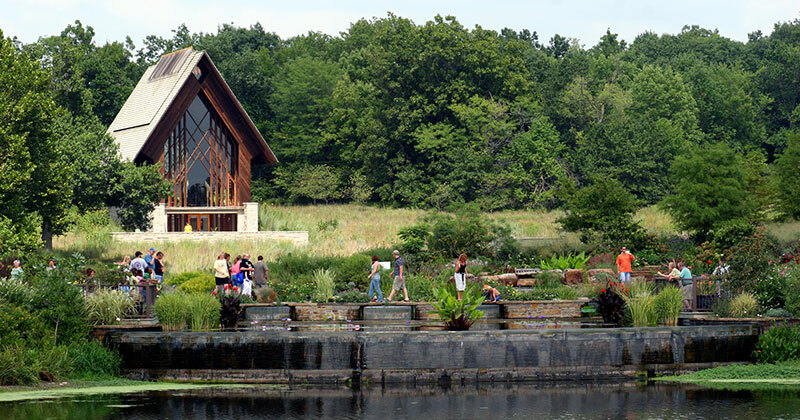 Powell Gardens is a not-for-profit botanical garden located just east of Kansas City, Missouri. Its mission is to provide an experience that embraces the Midwest's spirit and inspires an appreciation for the importance of plants in our lives. Set on 970 acres of lush, rolling hills and windswept meadows, Powell Gardens offers breathtaking display gardens, interesting architecture, a nature trail and a year-round calendar of special events and classes for the entire family. Powell Gardens is known for its spectacular garden displays incorporating native plantings and the Heartland Harvest Garden, the nation's largest edible landscape. Powell Gardens also has island gardens, water gardens and plants, perennials, woodland and stream gardens, quilted gardens, prairie grasses, many tree and shrub specimens and numerous other amazing botanical displays. The Gardens can be rented for weddings, receptions, ceremonies and other private events and has a beautiful chapel on the grounds. Personally, I just love wandering the grounds at different times of the year since the foliage, colors and blooms change with the seasons. I was there most recently on Mother's Day weekend and enjoyed a spectacular display of blooming iris in numerous colors. I plan to return later this summer to take in their upcoming display called Jurassic Garden: A Prehistoric Adventure. It will be on display from May 21 through October 3. One piece of advice....wear comfortable walking shoes!! For more information, check out their web site here. This month I'm recommending a neighborhood favorite of mine- Louie's Wine Dive- Waukee. 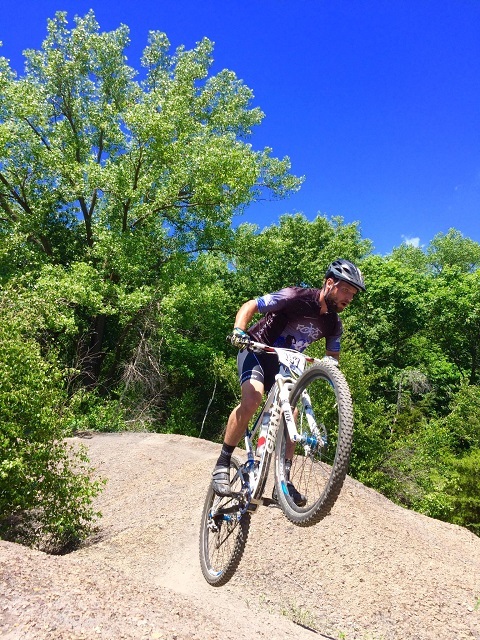 Situated on Hickman it's the perfect spot to hop off of the trail and enjoy a meal or beverage on the patio this summer! 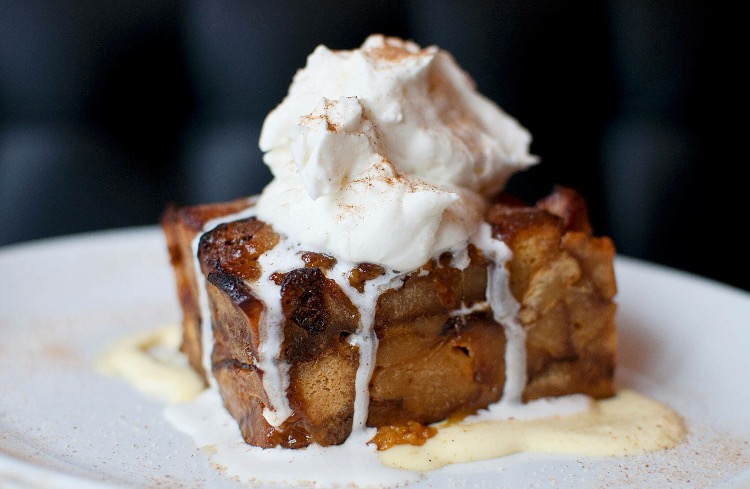 While their menu is full of mouth watering homemade appetizers and entrées I highly recommend that you save room for the White Chocolate Bread Pudding with bourbon crème anglaise. I haven't tasted a better bread pudding on this side of New Orleans! I've even called in a take out order for this delicious dessert on a Saturday night just as a sweet treat to enjoy at home during movie night. Needless to say I end up sharing with my husband and toddler but the portion size is perfect for sharing. Of course their happy hour specials and regular menu items are superb, but I also highly recommend their brunch on Saturday & Sunday. Pair a delicious Hibiscus mimosa with their Breakfast Flatbread Pizza (house made sausage, eggs any style, sriracha cream, mozzarella, tomato sauce, green onions, cilantro). Louie's Wine Dive is also kid friendly during meal times despite what the name may imply- and it is by no means a "Dive". The atmosphere is a good mix of classy and casual; it is very clean and inviting. Rarely do we need more motive than a craving for chuckles to check out a specific webpage. 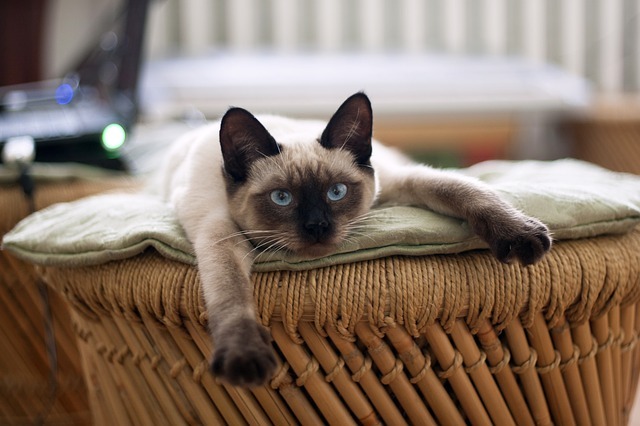 Well, this one offers you more than that… I Iz Cat is a stream of constant cuteness and revealing reports! Do you have a few minutes wait in a line, on a plane, at Compass Chiropractic? Then type in this entertaining site and the minutes will feel like seconds! Are you feeling a bit downcast on a difficult day? Click on this endearing blog to cheer yourself up!! Above all, I admire this site for its subtle but important advice to humans to spay and neuter pets, and to adopt little loved ones from shelters instead of purchasing from breeders. I also love that it features various non-profits around the world who are supporting our four-legged friends. Besides being a fast laugh, I Iz Cat is informative, progressive, inspiring, and heart-warming. To check it out, click here. This blog is a win-win situation! Recently I had the opportunity to bring my car in to the auto shop for a couple issues. First, I had been told by a larger auto repair chain that it needed new front struts for a few hundred dollars and I already had quotes from two shops. Then it started leaking oil and I was concerned I had a bigger issue on my hand. A few years ago, United Fleet had been "my car guys." I had met the managers of the Pleasant Hill and Urbandale locations through a business networking group and they were great guys and had always treated me honestly and fairly. Though the name makes it sound like they deal mainly with fleet vehicle, they have full service departments for all cars. Then one time I took my car to the chain shop for an oil change only because it was closer. Then my car just didn't have any significant problems for quite a while so I kept using the chain for the little stuff. With these bigger issues developing, I reached out to United Fleet for a quote on the struts. Their quote came in lower than the chain and the other smaller local shop so I scheduled my car. The oil leak repair was simple and under $100 and the struts were done in a half day. I was glad I'd used United Fleet. A couple weeks later the pipe going to my muffler became detached. I got it in to United Fleet and once again, they got it fixed up and back on the road for under $100. I was grateful because I was prepared to hear I needed a new muffler. After these couple experiences, I feel very confident about United Fleet and plan to use them for all my regular service needs as well as any larger issues that might arise. They have a location in Urbandale on 100th, on Second Avenue north of downtown, and over in Pleasant Hill.